Oskar, a 12-year-old boy, is bullied by his schoolmates. He spends his time fantasizing about revenge and stabbing trees with a knife. He obsesses about violent crimes, keeping a notebook of newspaper clippings. One day, a strange girl and her father move in next door. She seems quite unaware of social norms and completely immune to getting cold. Her father and she argue loudly and frequently, which Oskar can hear through his wall. Despite the fact that she tells him they can’t be friends, Eli and Oskar soon form a bond. She encourages him to stand up to his bullies, and he starts growing in self-confidence. But strange murders are suddenly occurring in his neighborhood, and Oskar begins to suspect that Eli is more than he thought she was. I have been interested in reading this book after reading a fascinating short story of his a few years ago. This book did not disappoint. It was eerie and consuming. It was also very gruesome, and it has some graphic child-sexual-abuse scenes, so beware. Luckily, I had read reviews of this book beforehand and already knew about the child abuse, so I was not quite as repulsed by it. However, this book lost an entire star because of the child-sexual-abuse, which didn’t appear at all in the movies and wasn’t absolutely necessary. The child abuse did help develop the character of Eli’s father as a disgusting and pathetic failure, but I think both attributes could have been manged in other ways. Or, at least, without the graphic scenes. In general, I am pleased with Lindqvist’s style – it is mysterious and flows well. The characters were well-drawn and believable (in a there-be-vampires sort of way). There dark, dreary mood was set early in the book and retained steadily throughout. There was nothing particularly original about Lindqvist’s vampire, though Eli had some original personality traits and circumstances. Also, I’ve seen this book described as a romance, and I don’t agree with that. Yes, Oskar asked Eli to “go steady,” but that was about it. I mean, he was 12, and those feelings were very naive and not pronounced. This was a book about friendship, not romance. 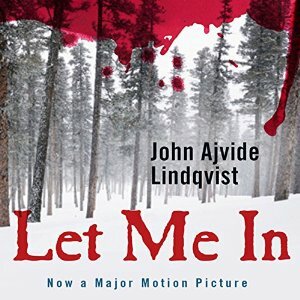 Overall, I was pleased with the book and would read another by Lindqvist, though I’ll probably wait before I can get through another that has sexual abuse in it. The audiobook was well-read – the voices were distinguishable and the pacing was quite reasonable. I had heard really good things about this book. The characters sound so well done. I like the fact that the protagonist sounds like he is troubled in a realistic way. The abuse scenes would likely bother me also. Thanks. It really was a well-written book. Though, like zombies, I'm getting a little tired of vampires. I'm glad the Halloween season is over because I outdid myself with horror this month.